The Avenger features a 360-degree rotating turret with two missile pods—which hold up to four Stinger missiles each (eight total)—mounted on a heavy HMMWV chassis. The turret drive is gyro-stabilized, allowing the missile pod to maintain aiming direction regardless of vehicle motion. Avenger is manned by a gunner, who operates inside of the firing station in-between the two missile pods. The gunner uses a glass optical sight that displays missile seeker activate, uncage, and fire permit indications. Targets are acquired by using the optical sight or the Raytheon AN/VLR-1 Avenger FLIR (forward-looking infrared), which is a laser range finder and a video auto tracker. [ii]FLIR sensors provide Avenger with a target acquisition capability in obscured battlefields, at night, and in adverse weather. 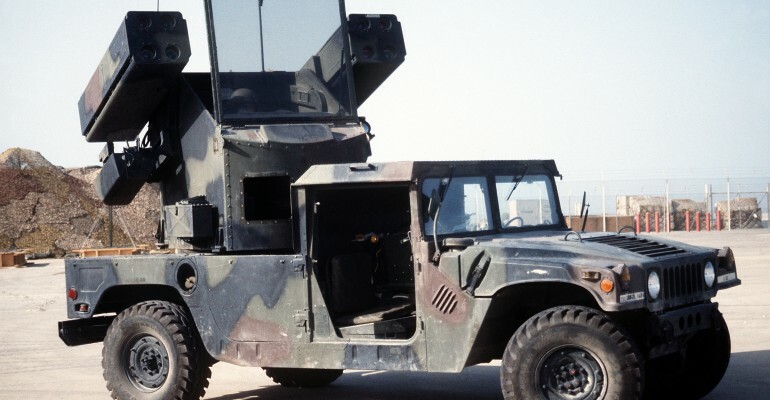 The Avenger’s primary role—medium and short-range air defense (MSHORAD)—fell by the wayside during the late 2000s because the United States prioritized other weapon systems in Afghanistan and Iraq. In 2004, the U.S. Army had 26 battalions with Avenger Short-Range Air Defense (SHORAD) capabilities, but prioritization of other weapon systems during operations in Afghanistan and Iraq caused that number to drop to nine by early 2017, of which two were within the active force and seven were in the Army National Guard. In response to renewed Russian aggression, the Army plans to deploy the Avenger system to Europe to fill the critical SHORAD gap in 2018. [iv]Of the over 1,100 Avengers built, only about 400 remain in service. Recently, the Army has initiated plans to resurrect retired Avengers systems that currently reside at the Letterkenny Army Depot and deploy the Avengers to Europe. A projected 72 Avengers will be refurbished and deployed in this plan. March 2018: The U.S. announced it will refurbish and deploy a total of 72 Avenger systems that had been retired in the Letterkenny Army Depot boneyard to Europe. April 2017: An Avenger fired Stingers at two UAVs in a test on Eglin Air Force Base, marking the missile’s first interception of a UAV target. January 2017: During the protest of the Dakota Access Pipeline near Standing Rock, the North Dakota National Guard deployed an Avenger as an observation platform. It was removed a month later to deescalate tensions. December 2008: The Laser Avenger acquired and tracked three small UAV targets and shot down one of the three. September 2008: The United Arab Emirates requested the Foreign Military Sale of 78 Avenger systems with 800 Stinger missiles. September 2007: Boeing carried out test firings of the Laser Avenger system. June 2006: Boeing was awarded a Foreign Military Sales contract for an additional 25 Avenger units for Egypt. April 2005: Eight Avenger vehicles in service in Iraq were modified for the ground security role. The right missile pod was removed and the M3P gun moved to the missile pod’s position, enabling 360-degree firing. March/April 2003: A number of Avenger systems were deployed during Operation Iraqi Freedom to provide air and ground security. September 2002: The Avenger vehicles participated in the Open Skies II military exercise which tested air-ground multi-layered air defense. Early 1999: The Army exercised a $14.6 million option on future production of an upgrade kit for Avenger air defense units. February 1992: The Avenger Project Office Awarded a follow-on $436 million 5-year contract for 679 units. 1991: The Avenger was deployed to support NATO troops during Operation Desert Storm. April 1990: The Defense Acquisition Board approved the Avenger system for full-scale production. 1988: Boeing delivered the first production unit to the US army. August 1987: The Avenger Project Office contracted with the Defense Systems Division of Boeing Company to build and deliver the Avenger system.